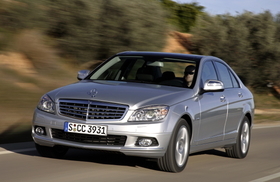 Building C-class cars in Alabama would save Daimler millions in wage costs. Daimler AG could move some production of its Mercedes-Benz C class to the United States from Germany, a German newspaper reported Wednesday. The Stuttgarter Zeitung said some C-class production could be transferred to the carmaker's plant in Vance, Alabama, from Sindelfingen, near Stuttgart, as part of a wider production shake-up planned by Daimler to reduce costs. In the future, the C class sedan could be built in three locations: Bremen, Germany; Vance, Alabama, and in China, the newspaper said. A spokeswoman for Mercedes-Benz U.S. International Inc. in Vance declined to comment on the speculation, saying there has no been no decision or recommendation about where to build the next generation C-class. Building about 80,000 C-class cars a year in Vance would save the automaker about 64 million euros (about $95 million) because the average hourly wage at the U.S. factory is about 30 euros compared with 50 euros in Germany, the Stuttgarter Zeitung said. Moving some C-class production to the U.S. would allow Daimler to avoid swings in the value of the U.S. dollar against the euro, and save import duties and freight costs. The Vance plant, which builds the M-, GL- and R-class models, has spare capacity. The plant built 66,710 units in the first eight months, down from 136,138 the year before, according to the Automotive News Data Center. The C class is Mercedes' top-selling car in the United States with 34,432 units sold in the first eight months, down from 50,593 the year before, according to the data center. Daimler told news wires that it had not made any decision on future C-class production.